Some clouds. Low 46F. Winds S at 5 to 10 mph.. Some clouds. Low 46F. Winds S at 5 to 10 mph. Road closed signs and barricades are ready to go up on the Credit Island causeway Wednesday, March 13, 2019. The current Mississippi River level is 8.9 feet and is expected to crest at 18.2 feet on Sunday. Here's the afternoon forecast from the National Weather Service. Rain is likely after 3 p.m. Temperatures will fall to around 46 degrees by 5 p.m. It will be windy with a south wind 20 to 30 mph gusting as high as 45 mph. The chance of precipitation is 50 percent with new precipitation amounts of less than a tenth of an inch possible. Tonight rain is likely before 7 p.m. Skies will be cloudy and breezy with a low around 33 degrees. West winds between 15 to 25 mph will gust as high as 35 mph. The chance of precipitation is 60 percent with new precipitation amounts of less than a tenth of an inch possible. Friday will see a 20 percent chance of snow showers before 10 a.m. Skies will be cloudy then gradually becoming mostly sunny, with a high near 40 degrees. Northwest winds between 15 to 20 mph will gust as high as 30 mph. Friday night will be partly cloudy with a low around 25 degrees. Northwest winds between 10 to 15 mph will gust as high as 25 mph. 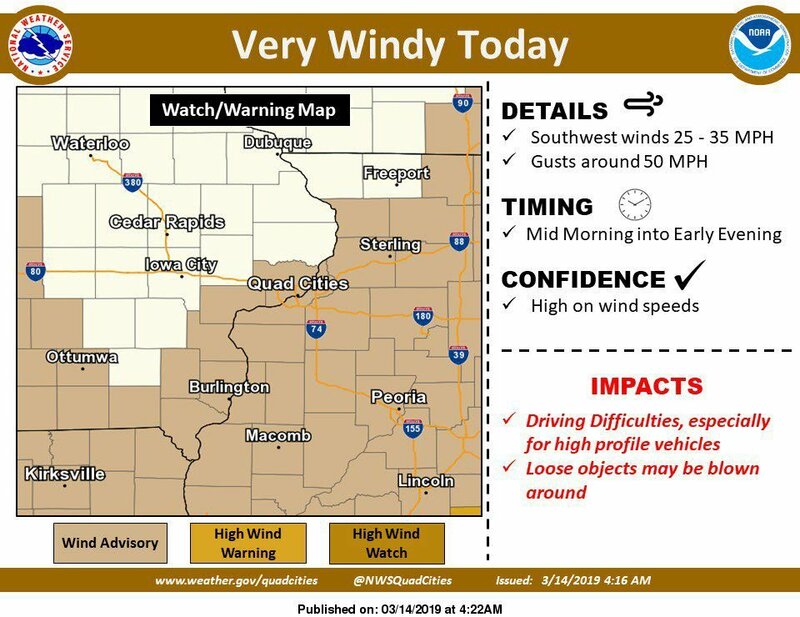 A NWS Wind Advisory is in effect for the region until 7 p.m.
An intense low pressure system will be tracking across Iowa today causing very strong southwest winds to develop. Sustained winds of 25 to 35 mph with gusts to around 50 mph can be expected. Drivers of high profile vehicles should use extra caution. A Wind Advisory means that winds of 30 mph and/or wind gusts of 45 mph are expected, which can make driving difficult, especially for high profile vehicles. Use extra caution if you are traveling. Many area rivers and streams are under flood warnings until further notice. • Monitor area river levels.